Buses to Khon Kaen leave from Mo Chit Northern Bus Terminal. 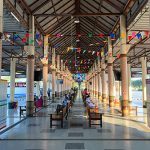 To get there, take the MRT subway to Kamphaeng Phet Station and from there a motorbike taxi (30 Baht) to the bus terminal. Of course you can also go there by metered taxi too, it’s around 140 Baht from Sukhumvit and 180 Baht from Khaosan. 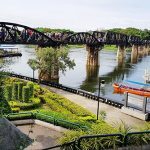 There are bus services to Khon Kaen very frequently, you can take a morning bus and arrive there in the evening, or take a night bus and arrive there in the morning. The 700km trip takes about 7 hours and costs around 300 Baht for a 2nd class air con bus or 500 Baht for a VIP bus. If you want to prebook your ticket (and choose a seat) then you can do that on BusOnlineTicket.co.th, the most popular bus ticket booking site in Thailand. The trip takes about 7-8 hours (more slowly, more stops than by bus) and the ticket prices are as follows: 77 Baht for a 3rd class seat, 179 Baht for a 2nd class seat and 368 Baht for a 1st class seat. Sleepers are also available (for the night trains) for an additional fee. This is your quickest option, but obviously also the most expensive one. Both AirAsia and Thai Airways have regular flight services from Bangkok to Khon Kaen. AirAsia flights depart from Bangkok’s Don Mueang Airport and Thai Airways flights depart from Suvarnabhumi Airport, and arrive 50 minutes later on Khon Kaen Airport, just west of the city off Highway 12. 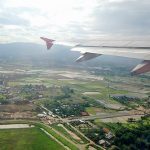 Regular flight tickets cost about 2,000 Baht, however there are some good promotions from time to time at AirAsia with fares from as low as 1,200 Baht. From Khon Kaen airport, a taxi or tuk tuk to downtown costs 150 Baht. Alternatively, there is a minibus service for 100 Baht, you just have to tell the driver where you want him to drop you off. A lot hotels in Khon Kaen also provide free airport pick up and drop off so check on that while you make your booking. Once you feel like you’ve got enough of the city of dinosaurs you may want to visit one of the two neighbor provinces that have an equal high amount of nightlife, girls and attractions to offer: Udon Thani and Korat. There are regular minivan services to both towns (about every 30 minutes from early till late) right behind the Central Plaza (see map below). They do the trip in 2 hours to Udon (100 Baht) and 4 hours to Korat (200 Baht). Slightly slower but also slightly cheaper are busses and trains. Busses take about 2.5 hours to Udon (80-90 Baht) and 5 hours to Korat (180-200 Baht, they stop more frequently along the way). When I did the trip from Khon Kaen to Korat last month I actually took the train just for fun (and because my hotel was just 100 meters from the train station, the SF Biz Hotel) but they only had 3rd class coaches at 1pm but the ticket only cost 38 Baht. You can check all departure times of the 4 daily trains to both cities (same line) and prices on the State Railway of Thailand’s Website.